This entry was posted in Zeitgeist and tagged Argument, Existential Comics, Philosophers, philosophical debates, Philosophy. Bookmark the permalink. A philosophy-friendly respondent might say that philosophy relies on the authority of logic, whereas science relies primarily on empirical data. From Plato to Kant, most lengthy philosophical tracts are all about untangling the enormous maze that obscures the fact that, given certain premises, certain conclusions must necessarily follow. Then the formally trained philosopher Wittgenstein came along and took your side, arguing that most grand philosophical questions have no answer because they are simply a misuse of language. Then Wittgenstein came back to philosophy 8 years later and changed his mind. So there you have it. I think I’ve reached the last frame of your cartoon. It might be that whether or not philosophical problems have authoritative answers is itself one of those interesting philosophical problems. I do think that some philosophical questions have solid answers. For example, just about everyone now agrees that logical positivist verificationism was wrong. Unfortunately, consensus conclusions of that type in philosophy are rare. Which is why I could never make it through “Philosophical Investigations”. It’s a sad day when you realize that “The Critique of Pure Reason” was easy reading. Tina, “authoritative” is a word I used for justification (evidence or logic) that leads to a consensus, which is rare, at least among the most interesting questions. I agree that the word has baggage. Maybe “conclusive” would have been a better choice? Definitely, philosophical conclusions can be personally satisfying. I feel comfortable with my own personal philosophical conclusions, even though I don’t have evidence to convince everyone that they’re right. I think that’s the value in exploring the questions. You can’t find an answer that will lead to a consensus, but you can often find one that convinces you personally. The cartoon is a satiric riff off the old film, Twelve Angry Men – which I wrote about here: https://nosignofit.wordpress.com/2015/01/22/reasonable-doubt-and-its-reasoning-how-do-we-agree/. 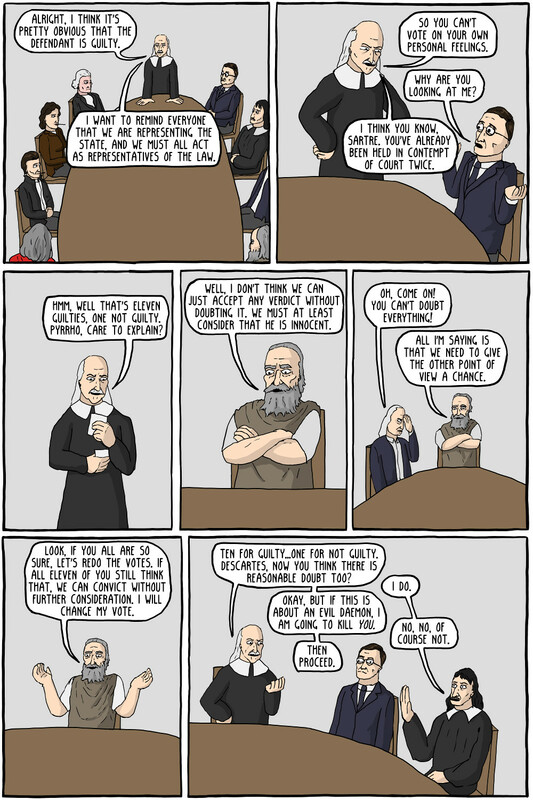 The jury of philosophers has achieved something, they achieved a hung jury, which has legal consequences. However, deciding the fate of the accused in a trial, is not what philosophy is about. If you watch the original film, you will realize that several jurists are indeed approaching the problem from philosophical perspectives, but whatever they know of these perspectives is propaedeutic to the jury process, not directly a part of it. The philosophers who actually developed those perspectives knew full well that they were not addressing immediate issues, but thinking generally as preparation for consideration of such issues. I confess that I am always a little bewildered by claims that philosophy should reach a final answer, or of disappointment that philosophy hasn’t yet reached a final answer. One should run away from any philosophy claiming to have final answers – that’s called ideology. The function of philosophy is to question, consider, offer possibilities in the form of logical argument, search for greater understanding, approach wisdom. The differences one finds in philosophy form one of its greatest strengths – the ability to offer guidance and clarity for a great many people from a variety of cultural backgrounds. The study of philosophy, any philosophy, is not for every one. But entire lack of some philosophic background may lead to finding one’s self on a jury and voting with one’s emotions and unexamined prejudices. Agreed on all points. It’s been a while since I saw that movie. You’re making me want to go look it up and do a rewatch. Even in science, those authoritative answers tend to have shelf lives. Thanks for sharing. This is fun.